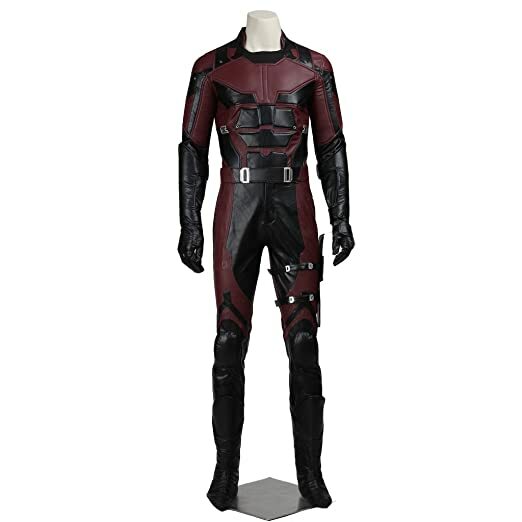 At Superheroes Central we are always looking around for cool superhero stuff and in this case we’ve brought a pair of the best authentic and realistic Daredevil costumes for men that we could find. Created by the legendary Stan Lee, with contributions from Bill Everett and Jack Kirby he first appeared in 1964 in Daredevil #1, and in those days he looked very different because his costume was red with yellow jacket arms and pant legs, and not the iconic mono red jumpsuit and hood emblazoned with his famous DD logo on the chest. Indeed the man without fear has endured and thrived in the 50 years since his creation, having been brought to the big screen in the Daredevil movie starring Ben Affleck and he has been brought to the little screen with the popular TV series of the same name, taking his place among Marvel’s most popular superheroes. And so we looked for some of the best Daredevil ideas for the adults that could find, and to tell you the truth we were a little disappointed that there was not more costume selections for a hero of his stature, but on the positive side we were able to find two authentic Daredevil costumes that really define the direction the character has taken over the years. the first costume is an original marvel Daredevil costume that looks like it walked right out of the comics, which is awesome. The second costume is a perfect Daredevil for cosplay, modelled after the suit seen of TV it’s just so realistic and really high quality. So we hope these Daredevil costume ideas help you out, and that you’ll find the one that’s best for you. Next up we have this very realistic Daredevil cosplay costume for sale, and straight away you can see the quality of the outfit. Based on the popular television show Daredevil, this is a seriously authentic costume for serious fans, and we know your out there. We get that people love to get all dressed up as their favorite superhero, whether it’s for parties or the more serious cosplaying at the various conventions, and we also understand that some people spend that extra money for the best results, and that’s what this Daredevil costume is, it’s a next level costume. Made from synthetic leather the costume includes the mask, top, pants, gloves and boot tops, it comes in a variety of sizes but significantly also has a custom size feature, where you send in you measurements and they make the perfect costume for you. Awesome. There were not a lot of reviews at the time of writing this article, but the people who bought this costume were very impressed and very happy, and if your looking to dress as the man without fear than this is the best realistic Daredevil cosplay costume for sale. So how great does this original Marvel Daredevil costume look? It’s so cool. Made from polyester this full red jumpsuit comes complete with mask, gloves and boot tops, the chest even features the icon DD symbol and is padded out to give heavily muscled appearance, as have the arms which is great for those us who haven’t been hitting the gym as often as we should. 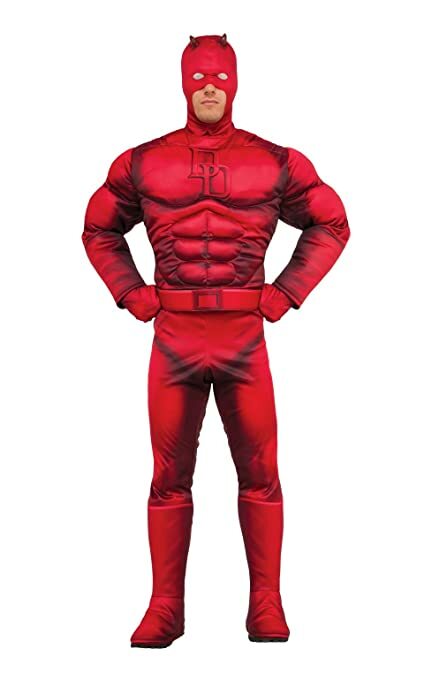 For fans of the comic books this is the best Daredevil costume for sale. Something else worth considering, is that this product is very reasonably priced and is not a large outlay and you really will have some fun at your party. As always when writing these articles we look on You tube to do some research, and we found the great video that shows not only the costumes we featured in this article but other cool Daredevil costume that have featured in the comics over the years, we thought #8 and #3 were the best and couldn’t decide which was our favourite,. So watch the video and see which Daredevil costume you like the best. Daredevil has had a few rough breaks in life, but he’s made lemonade out of lemons. Matt Murdoch grew up in hell’s kitchen raised by his father “Battlin” Jack Murdoch who was a lower ranked professional boxer who found work hard to come by. When he was a child he was walking down the street, he saw a blind man about to be hit by a truck, without hesitation Matt pushed the man out of the way but the truck was carrying toxic chemicals, and when they spilled onto Matt he was blinded. Fortunately although he lost the use of his eyes his other senses were heightened to the extreme, and he even gained an unique ability, Matt found that he could use a sort of radar or sonar sense to outline objects around him, overcoming his blindness. So Matt trained on his father’s boxing and gym equipment honing his new found abilities, but he continued to study hard because his father had wanted a better life for his son. Matt obeyed his father’s wishes and eventually got into law school. although he never stopped training Unfortunately fate wasn’t to be kind to the Murdoch’s as Matt went to watch his father in a boxing match, but before the fight Jack Murdoch was told that all his fights had been fixed and tonight it was his turn to lose, or he would be killed. Jack didn’t want to lose the fight in front of his son so he won it, and later that night he was killed. Matt never forgot, and was determined to see the men responsible brought to justice..
After law school Matt set up a law firm in hell’s kitchen with his partner and best friend Franklin “Foggy ” Nelson, but at night he became the man without fear, Daredevil. And his first action was to bring the fixer that killed his father and his thugs to justice. 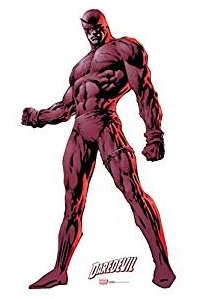 Daredevil’s main powers are heightened awareness and reaction time, but he is also extremely proficient in hand to hand combat and he also uses his tricked out walking cane as a billy club. The bad guys in Hell’s Kitchen soon learnt to be wary of the crimson avenger. As his fame and reputation grew he began to cross paths with other famous superheroes like Captain America and Spiderman who after figuring out his secret identity and nearly accidently exposing him, became one of his closest friends. He has also had a few relationships including the Avenger Black Widow as well as the assassin Elektra amongst others.